I sometimes have a salad for lunch. Then about an hour later I think to myself “Dang, I’m really hungry, it must be time for lunch!” Then I remember I already ate my lunch and go get a candy bar. Defeating the purpose of eating a salad in the first place. Lo. I hath loled unto this comic! I was hoping for a vomit joke, though. Somehow, it woulda been funnier to me. As always, Biff’s wisdom is overshadowed by his stupidity. Dang, should have read the caption before thinking. Hmm I first thought Biff was making a confetti bomb that prematurely detonated, but I was wrong. It doesn’t COMPLETELY defeat the purpose. You still get a nice system cleaning. Three words: Spring Loaded Salad. At least, that’s what I thought. I was thinking more of “Biff learns where he left that firecracker leftover from the 4th of July.” Hey, it’s Biff, and it could happen! how come sometimes there is a first and end button, but other times there isnt? @Kagedviper – The main page has the first button, the individual page for each comic just has back and forth. You can jump around with the archive dropdown at the top right of the page. http://www.thebookofbiff.com/wp-content/uploads/2007/08/0308-fight.png This was my first thought when I saw today’s. lol. I like MadDavid’s guess. 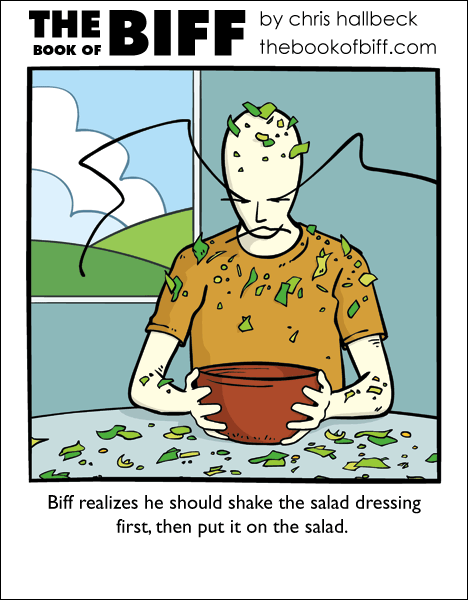 @ steve-o — Biff put the salad dressing in the salad, then shook the whole salad. This reminds me of an act of stupidity I once did when I was about twelve. I was making a salad so I got out the salad dressing and shook it up and opened it. Then I got out the salad, made it. When I had finished with that I reached over and picked up the salad dressing and in a moment of stupidity forgot I had already shaken AND opened it. I gave it one quick hard shake…and spent the next ten minutes getting Catalina out of my hair. from the first glace i thought he was covered with bottle glass…in which i thought it would have said “Biff shouldn’t make bikers angry at the local bar”.